WASHINGTON—Vowing to make this the first day in a long war against corporations and the 1 percent, hundreds of thousands of unionists gathered and marched from coast to coast on a “National Day of Action” on Feb. 24 to campaign for workers’ rights and specifically against a looming threat to them – the U.S. Supreme Court’s Janus case. From Los Angeles to New York to D.C. to Chicago to Richmond to Philadelphia, workers and their allies declared they would fight against corporate plutocrats and their bought-and-paid-for politicians. And they pledged to do it together, in organizing drives and at the ballot box. “We will never win without one another,” Mine Workers Secretary-Treasurer Levi Allen said in an interview at the D.C. rally. “We are the union and we won’t take their bullcrap no more,” American Federation of Government Employees President J. David Cox declared from the podium there. The specific cause that brought thousands into the streets was the High Court case, pushed by the rabid anti-union National Right to Work Committee, its legal defense arm and its corporate backers. In the case, heard on Feb. 26, the justices will later decide whether every state and local government worker in the U.S. could become a potential “free rider,” using union services, but not having to pay one red cent for them. Latest federal calculations show 6.24 million state and local workers nationwide are union members, while unions represent another 576,000 state and local government employees. 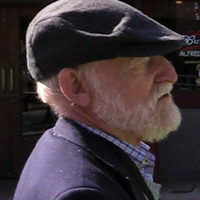 Some of the latter group – those in so-called “right to work” states – are free riders. An anti-union ruling – widely expected – would make all state and local workers, including those who are members now, “free riders.” That could cost unions thousands of members and millions of dollars. Speakers didn’t stress the legal specifics, though. 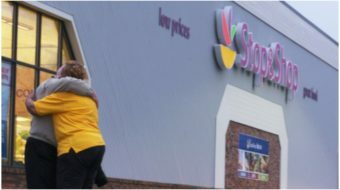 They warned of the harm an anti-union ruling brings to all workers – and demanded and pledged workers would fight back through organizing and politics. 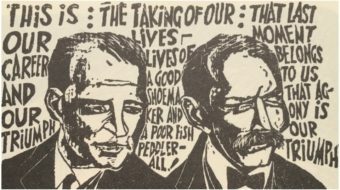 The case, Janus vs AFSCME District Council 31, revolves around the claim, by Illinois worker Mark Janus and two others, that anything any union does is “political” and thus violates his free speech rights by collecting “fair share” fees to pay for contract bargaining and grievances, and nothing more. The GOP Trump administration sided with Janus and the right-to-work crowd. 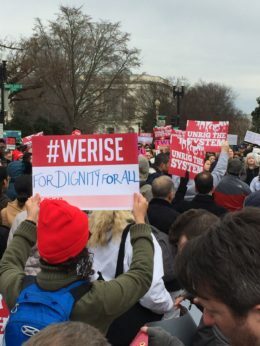 At the marches and rallies, speakers stressed the harm that could hit all workers if unions lose the money and power to defend all workers, particularly women and people of color, who make up disproportionate numbers of government workers. Shuler noted 18 percent of all state and local government workers are African-American women, for example. “Why is the corporate right wing trying to destroy us? Because they want more power, and they know preventing working people from joining together aids their power,” Shuler said. She also stressed – and personalized –how vital public workers are to the nation and their families. “This is about the single mom who relies on a union to let her bring home a decent wage to feed her kids. This is about a fire fighter who puts his life on the line” to run into burning buildings to rescue people. The gunman killed 14 students, two teachers and the school’s athletic director. The teachers, both American Federation of Teachers members, died protecting their students. The case and the right wing’s efforts are “an assault on democracy, on everybody who cares about fairness and on everybody who cares about families,” Gov. Tom Wolf, D-Pa., told the D.C. crowd. Gov. Kate Brown, D-Ore., and Rep. Eleanor Holmes Norton, D-D.C., also spoke there. “This is the culmination of decades of attacks on working people by corporate CEOs, the wealthiest 1 percent and the politicians that do their bidding to rig the economy in their favor,” said Grace Catania, president of the Chicago News Guild-CWA, before a rally at Daley Plaza there. Unionists interviewed at the D.C. rally agreed with the speakers that all workers – union and non-union – would be hurt, and not just by a High Court anti-union ruling in Janus. Speakers also urged continued militancy. Rosenblatt said electoral politics is one big solution, through mobilizing to elect more pro-worker congressional Democrats this fall who can then overturn a negative Janus High Court ruling. AFSCME Local 2467 President Margaret English said more organizing in their own shops is needed – a point Shuler also stressed. 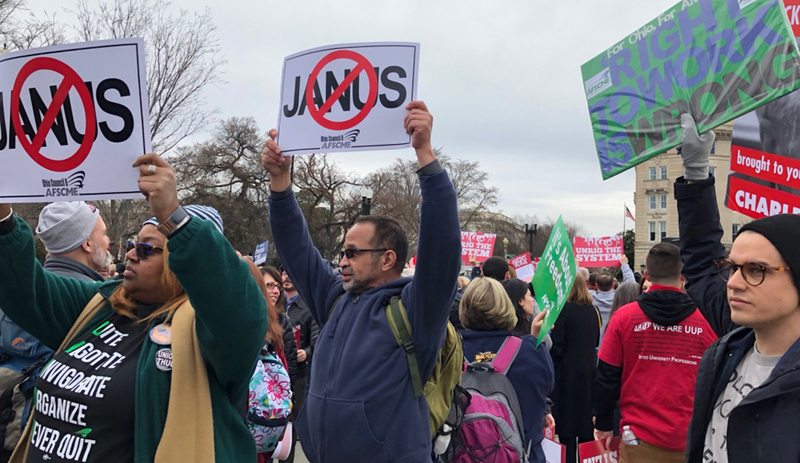 “We’re urging our members to renew their memberships and getting the fee-payers” – the first to become “free riders” in a Janus decision – “to sign on, by talking to them 1-on-1 to educate them on the advantages of being union members,” English said.